Louisa Picquet, b. 1828?- and Hiram Mattison, 1811-1868 Louisa Picquet, the Octoroon, or, Inside Views of Southern Domestic Life. 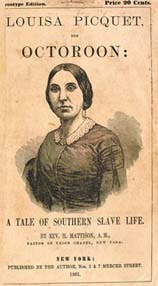 Louisa Picquet, the Octoroon, or, Inside Views of Southern Domestic Life. New York: The Author, 1861. Manuscripts, Archives & Rare Books, Schomburg Center for Research in Black Culture, New York Public Library, Astor, Lenox and Tilden Foundations provided the text for the electronic publication of this title.